The Eisner Awards recently crowned Hawkeye number 11 the best single issue of 2013. Entitled "Pizza Is My Business," the story took a semi-break from Clint Barton's fight with the mobsters set on destroying the apartment building he owns, and explored the perspective of his pizza-loving dog, Lucky. The mobsters still made an appearance, along with a fetching female dog in their employ. But the remarkable aspect of the issue was not the plotting. 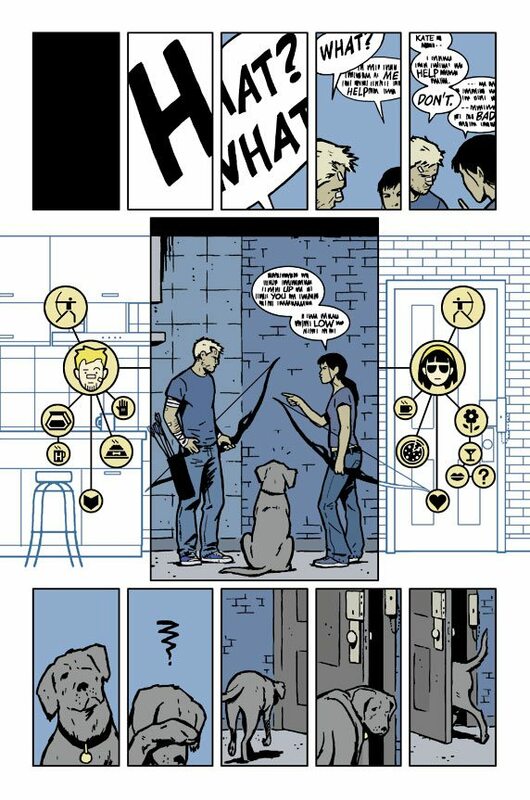 It was the way writer Matt Fraction and artist David Aja looked at the world through Lucky's eyes. Dialogue was eschewed for smells and gestures. A Chris Ware-like attention to structures and page-wide maps told Lucky's story in a way previously unseen in superhero comics. Hints had been concealed throughout the series before issue 11, but Pizza Dog's story demonstrated that the creative crew was more invested in how perspective influenced plot than the other way around. In many superhero narratives, operatic plots are the be-all, end-all. Thematic content or characters beats take a backseat to solving the ridiculous problem of how to save the world. In Hawkeye, how characters perceive the plot supersedes the action. This approach has made it unique and beloved among Marvel Now! books, and it's not hard to see why. Lucky's journey through Clint's apartment building is a treat because no other series on the stands would showcase a dog's point of view. We are planted firmly and creatively in Clint and Kate's perspectives in this series. It becomes impossible not to root for our heroes because we so strongly see the world through their eyes, as if we were watching movies playing in their heads. Such impressions prove the power of comics to play with time, point of view, and action. When people tell me comics are dreck, I hand them books like Hawkeye, which demonstrate comics' potential. Of course, this series has its problems. Clint is very much a white straight guy, and there are already a lot of white straight guy heroes in comics. Clint is set apart by his truly terrible decision-making, but the "bro bro bro" refrain from his thug antagonists can get tiring. Likewise, Kate's penchant for Kate-ifying everything (she calls trouble a "Kate-astrophe") can get grating. Such are the dangers of pointedly placing the reader inside the characters' heads. The long wait times between issues has also been hard to accept. (Fraction's decompressed storytelling, which has showcased the same series of events from four different perspectives, will likely read better in trade, instead of month to month.) I've found myself falling out of love with the series, despite its innovation, because I'm never sure when the next issue will appear. And since the two Hawkeyes are living across the country from one another right now, I've lost a sense of the story's larger stakes, at least regarding protection of Clint's apartment building. That's all changed with issue 19. I didn't even realize the book was coming out today, so unaware have I been of its extended schedule. Luckily, my friend Nick linked me to a New York Times article last week discussing the fact that the series would be embracing Clint's past as a hard of hearing hero. After reading about Fraction and Aja's intentions, I got pretty fired up. I've always been troubled by Marvel's claim to bonafides in portraying disability; Clint rarely if ever displays hearing loss in appearances I've read, and while the creation of Blue Ear is an amazing story people link me to on a consistent basis, I'm still aware that Marvel recently "fridged" its one Deaf female hero, Echo. Hawkeye's artistic and editorial team working to share the perspective of somebody with hearing loss could only be a light in the darkness. If you have any interest at all in graphic innovation or diversity in comics, please, please, PLEASE pick up Hawkeye 19. When we last left Clint, his ears had been damaged by an assassin, and his brother Barney had been shot. At the start of this issue, not only is Clint mourning the loss of his hearing, Barney is adjusting to the use of a wheelchair -- which Aja depicts in detail, as Barney must transfer from his chair to a car seat for the cab ride home from the hospital. Clint refuses to read lips, which leads to Barney encouraging him to speak via sign language. Clint's perspective is represented through blank speech bubbles, and Barney's signs are displayed in spelled letters or "how-to" manual type graphics, as shown above. Late in the story, when Clint begins to read lips, his tenants' words appear in lopsided bubbles, with sentences broken up into parenthesized fragments. (Still, their agreement to work together to rid themselves of the villains terrorizing their lives is represented not in speech, but gesture -- the powerful image of several raised arms, in unison.) If Fraction and Aja aimed to depict the non-hearing world for those who can hear, I'd say they more than succeeded. The effort it takes to decipher this story reminds me of the extreme focus I need to employ when my hearing aid is in the shop. And Clint's efforts to touch the world and understand it become more worthwhile and celebratory for his concentration and effort. Hawkeye's hearing loss has appeared and disappeared before, but I hope it at least sticks around for the rest of Fraction's run, which ends with issue 21 or 22. Marvel could use the perspective; such characters only enrich the company's universe. And if you look at the sales numbers for digital comics and comic book movies, it's clear the audience wants more than white bread heroes. With diversity being triumphed by many creators and even companies, with the reading audience broadening and clamoring for more varied points of view, a big change feels like it's coming to comics: one that includes as many points of view as there are people on the planet. Hawkeye artists: Matt Fraction, Writer; David Aja, Artist; David Aja & Chris Eliopoulos; Matt Hollingsworth, Colorist. I am a big admirer of year-end lists. Yet there are reasons not to be. Lists can reduce the year's output to a simplified collection of already well-covered moments. They can inadvertently steer a body away from searching deeper into the records of pop culture, to discover objects on one's own. They can define taste, instead of interrogating it. On the other hand, such lists can still introduce a person to a movie or book or play they'd never consider otherwise. Or, lists can force one to reconsider something long filed away as inconsequential or lost. And, let's face it, there's a lot of entertainment to be had in seeing critics praise art you already appreciate. I guess what I'm saying is, your mileage may vary. Me, I love lists! So I thought I'd post one of my own on the good old blog, specifically centering around achievements in comics this year. I spend a lot of time on this blog being critical Sarah. I thought it might make a nice change of pace to celebrate the year 2013 in comics, through five (by my standards) noteworthy comics. These are my choices. What are yours? Sound off in the comments section! I'll start with my most anticipated read of the year: March. I actually gave Congressman John Lewis' graphic memoir to my father for Christmas. Largely inspired by his connection with and consumption of the 1957 comic Martin Luther King and the Montgomery Story, this book is the first of three to chronicle Lewis' life and his involvement with the Civil Rights movement. The first volume deals with Lewis' young life, and Nate Powell's beautiful black and white art quickly draws you into Lewis' perception of the world around him. Particularly striking are the book's opening moments, when a young Lewis preaches to the family chickens, and the closing pages, which involve a paddy wagon full of arrested individuals driving "off-screen" as they sing about overcoming great obstacles. Lewis and co-writer Andrew Aydin intended this story to teach future generations about civil rights and the work of Dr. King, just as that 1950's book taught him. There are many lessons throughout the book, but it never reads as dry or didactic, only engrossing and awe-inspiring. Brian K. Vaughan and Fiona Staples' Saga arrived on shelves in the spring of 2012, but it's been on my mind ever since. The story of two parents trying to raise a child in a mixed-up world might seem old hat by this point in human history, but add in intergalactic wars, ghost nannies, robot princes, and a cat who can tell when you're lying, and everything old becomes new again! Staples' down-to-earth pencils and ink ground this space opera in human concerns, like what happens to a body after pregnancy, or how to get a job when one's entire family is on the run from two sides of the same war -- and while I don't discuss lettering much in this space, Staples' handwritten narration gives a glint of the sassy grown-up child these parents will raise. Of course, Vaughan's signature sense of humor and heart saturates the plot, but it is his dissection of narrative as life-sustaining, and family as the forge that shapes and even melts our sensibilities, that define the book. Released in increments to give Staples enough lead time to craft the tale well, this creator-driven work engages with its audiences' real-life concerns in a visceral, vibrant way. How to talk about Young Avengers? I've read interviews where writer Kieron Gillen equates the team book with the adolescent act of starting a band. It's also clear the entire short season of fifteen issues is meant to be a metaphor for being eighteen, for being on the cusp of adulthood, of learning one's possibilities and limitations. Hailed by many comics sites as something new, a pop-infused story that addresses ACTUAL young people (instead of middle-aged readers who grew up with Superman and The Simpsons), this book was labelled Tumblr bait by cynics, even as optimists embrace its shirtless Noh-Varr scenes and emotional roller coasters. What can't be disputed by anyone is the genius of the artwork -- Jamie McKelvie and Mike Norton sculpt classic comics facial expressions into pop art shots, and muck about with traditional layouts, even breaking borders between panels to connect their isolated teenagers. This book may be ending soon (I blame the need to boost Loki's age, in order to appease Tom Hiddleston fans, I suspect), but its appeal lies in its "flash-in-the-pan" nature. The Young Avengers save the world, then go for Korean barbecue afterwards; the sad truth of adolescence is that good nights like that aren't meant to last forever. Astro City brought me back to reading comics on a monthly basis two years ago. So it's only fitting that the series' return should end up on my "top of 2013" list. Now published under Vertigo's banner, Astro City hasn't lost a step, even after vanishing for a time due to scribe Kurt Busiek's health concerns. The new group of issues has examined both the heroes and regular citizens of the titular city, with covers from painter Alex Ross warmly inviting us into Busiek's bright world. Interior artist Brent Anderson has made the transition from pen and paper to digital, and his work remains as clear-eyed and emotional as ever. Meanwhile, Busiek builds and builds his superheroic universe, adding in call responders to a hero hotline, a giant alien presence intent on studying humanity, and a potentially unhinged fourth wall-breaking miscreant -- while revisiting old faces, including a retired family man, a stuntwoman psychic, and our first-ever look into his Wonder Woman stand-in, Winged Victory. At the end of each issue, a tiny street sign alerts us that we are now leaving Astro City. When the book was on hiatus, that notice struck me as bittersweet. Now the story continues, and I can't wait to come back. I've written and written and written about Daredevil. About Mark Waid's interrogation of fear and fearlessness, of perception and obsession. About Chris Samnee and Paolo Rivera and Marcos Martin and Javier Rodriguez and their consistent, snappy artwork. About my appreciation for a book that actually addresses disability, even if its central character is essentially sighted, given his radar sense. So what haven't I praised about this title? What's left to write about? I'll tell you what's left -- lawyer and Dare-love interest Kirsten McDuffie. She's amazing. She's basically Lois Lane, except she was in on the secret identity thing from the get-go. 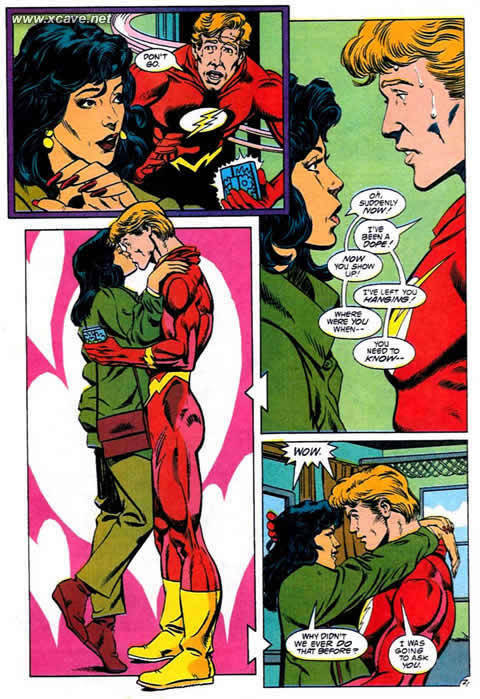 So I guess she's more like Linda Park, a woman Waid has had some experience scripting in the past. In the latest issue of the Dare-saga, Kirsten flirted with danger by addressing New York citizens via some sort of super-microphone during a crisis. In the process, she officially won Matt Murdock's heart, as she set everyone straight about the fear-mongering Sons of Serpents, a group of racists intent on creating mob rule in the Big Apple. Corny, sure. But Kirsten's heroics are just as important as Daredevil in this book; that is a refreshing change of pace for a love interest. Hawkeye is a book about what Hawkeye does when he's not being an Avenger, usually when he's hanging out with the other, cooler Hawkeye. Also, it's about his dog Lucky, who loves pizza. Helmed by writer Matt Fraction, artist David Aja and colorist Matt Hollingsworth, this book has been a fan favorite for months, even as it's gotten a bit behind schedule, shipping-wise. But it's worth the wait. Fraction's decompression of time can be trying when read a month at a time, but his current insistence on telling street-level stories from a variety of perspectives, including Pizza Dog's, has brought a lot of enjoyment to me, personally. Aja's work can be sprightly and perceptive (as when Hawkeye leaps through the air naked, and a little Hawkeye mask covers his unmentionables; or when a phone conversation with Kate is split into thirty-something distinct panels). Hollingsworth gives everything a purple tinge and a cartoony look that makes Hawkeye's world seem pretty basic, even as the writing deepens Hawkeye's descent into poor behavior. With Clint Barton's book, come for the humor, stay for the inventiveness and emotional gut punches! When people tell me that DC Comics are old hat because they features icons as opposed to characters, I respond that that's the challenge in finding astounding, surprising DC stories -- in a great tale, you see behind the icon, to the humanity that shaped it in the first place. People tell me if I want character work, I should drop DC and just read Marvel (which I do read, in tandem with a few hold-out DC books). Marvel's amazing hook, I'm told repeatedly, is that heroes like Spider-man still have to take out the garbage and pay their bills at the end of the day. They have ultimate power, but they still face reality, same as us. Let DC have their high-flying space fantasies. Marvel generates heroes that relate to you; they're down to earth, as they should be. I tire of hearing this. At the end of the day, Thor is as much a fantasy as Batman; you get out of what you put into either. Yet I can't necessarily deny an affinity for Marvel's conflicted image of Spidey saving the world while ruining his personal life on a daily basis. I do believe that the DC characters are more affecting once a writer finds a way past their iconography (see Kurt Busiek's Superman: Secret Identity, or The Dark Knight Trilogy, for two examples), and reveals the twinned angst and hope that fuels all superheroes. But honestly, asking me to choose one corporation or one set of characters over another is asking me to stop talking to you pretty much immediately. Because I demand much more than simplicity and tropes from my superhero comics. I demand the artists working on them have something to say about things that have existed in American culture since the 1930's. I was pretty much done with comic book movies last summer, as they'd fully adopted the lazy plotting of mainstream comics storytelling. I'm tired of DC's marginalzation of its female fans (though there's one bright spot lately). I'm tired of people complaining about comics going pop culture (it was extremely popular stuff once upon a time, folks). What I still love is the work itself, when people are trying something fresh and unexpected. Mark Waid recently started an appealing run on the Green Giant. To be honest, I've never really gotten into Dr. Banner and his particular Mr. Hyde. I get the hook, but I want more than hitting stuff out of my reading matter (says the girl who loves Superman, natch). But in the Indestructible Hulk, Waid is flipping the script in a compelling way. In the first issue, Bruce admits he needs to stop trying to cure himself of his Hulkiness. Only by off-setting his destructive tendencies through using his genius brain to make scientific breakthroughs, will he find peace. Elsewhere at Marvel, Hawkeye's precise target-based perception taunts his inability to make good choices in his personal life, and Professor X's mentally imbalanced son tries to do some good after years of being a jerkface. At DC, Batgirl rises above her post-traumatic stress and Superman experiences alienation in a city of millions. Such problems are relatable, but they often come to us through flights-and-tights-focused glasses. This is the true power of superhero comics to me. To be theatrical, to transport, to surprise visually as well as emotionally, through carefully chosen obstacles. If we split things down company lines, or movie lines, or even trope lines, we're losing what's unique about the medium: that conflict can be ridiculous and still hold water, that it can be magical and still tell us something about ourselves. That we can build something even after we break it. And I guess I just needed a minute to say that. If Only I Had A TARDIS! But let's catch up, anyway! So much has grabbed my attention the last few months. The holidays! Producing February's Chicago Madness (the theme -- write a scene with your own M. Night Shymalan twist)! Working on curriculum and teaching for Silk Road Rising! Watching DC's disastrous choices involving Clark Kent and Wonder Woman's romance, the company's firing and rehiring of Gail Simone, as well as its weird blunder of hiring a homophobic writer while one of their top books pushes forward with the engagement of an awesome lesbian couple! Looking on as Marvel launched a new world of books that take artistic risks and build up a solid stable of writers! But I haven't written about a lick of it. I wish I had a good excuse, or some particular bit of something stuck in my craw at the moment. Mostly I've been working, attempting to launch my next big writing project, and enjoying comics, along with an amazing read in Andrew Solomon's Far From The Tree. I haven't really mellowed out on discussing comics' reflection of our society, but I found I needed a bit of break from being up in arms about things, especially after the Christmas miracle that was Gail Simone's rehiring. HAWKEYE, Aka, The Best Book I Had No Idea I'd Ever Fall In Love With, Ever! Clint Barton, his dog named Pizza Dog, and most importantly, his brash and brave partner-in-superhero-fighting crime, Kate Bishop ... they all bowled me over when they rolled onto shelves last summer. Weird to use a bowling metaphor for a comic about archers, but I have no other way to explain how this book stunned me stupid when it arrived in my life. It hit me in the head like a bowling ball. A fun, cocky, mayhem-filled bowling ball -- all right, I need to stop this. The point is, I have never cared about Clint Barton. Even when he was blasted deaf due to an explosion (of course, he was cured), I didn't care about him. 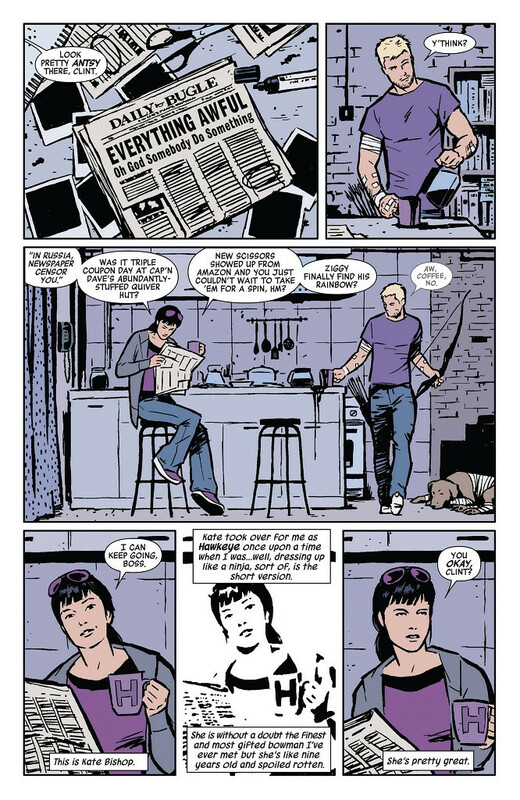 But writer Matt Fraction and artist David Aja have brought a clarity and amusement to Hawkeye's adventures, highlighted by Clint's translations of foreign languages into Pigdin French, and Aja's breaking down a bow movement or falling out of a skyscraper across several panels. It's impossible not to love the lug! Not when his book is this stylish, bouncy, and action-driven. But the real heart of this enterprise comes in the form of Young Avenger Kate Bishop. Another Hawkeye, she outperforms "Hawkguy" at almost every turn, even as she forges a strong emotional bond with her mentor and predecessor. Kate is truly one of the great female comic characters out there, and even though her hero's journey starts in a sadly typical place for women in comics, she has since outshone that origin and become the second lead on a book that has done nothing but surprise me since it debuted back in August. Check it out for a fun ride. DAREDEVIL, Or, My Favorite Story About Disability & Its Ties to Personal Power! I already wrote about how amazing I think Daredevil is, and it's no secret that I absolutely adore Mark Waid's sharp, insightful writing. However, it doesn't yet go without saying that you should be reading Old Horn Head's stories at the moment. In fact, this week's issue, number 23, is a great jumping-on point! And if you know what's good for you, you'll backtrack and read the entire series to date. Because this book will impress you with its thoughtful depiction of disability (or lack thereof), as much as it induces smiles with that catchy swashbuckler aesthetic. Each rotating artist has been given a lot to tackle by Waid, who challenges them to depict blindness in a visual way. Of course, Matt Murdock is only partly blind, and crackerjack pencillers, inkers, and colorists have taken every opportunity to put you behind the eyes of a man who "sees" with sonar. I appreciate this derring-do because I often feel lonely reading superhero comics. There's rarely anyone disabled populating them, somebody who reflects my world view (even as I have adopted secret identities and kryptonite as translations of my identity). Often the disabled aren't allowed to share their perception with the larger readership. Waid turns that on its head for Daredevil; he treats Matt as a man whose abilities are directly informed by his disability, and we're in on the secret with him. We know why he cares about what he smells and what he hears. We know what's important without sight, the same way he does. And like us being in on the joke with Clark Kent, knowing he's Superman, we know blindness is not a weakness for The Man Without Fear. CAPTAIN MARVEL, As The One Book I Know Led By A Female Fighter Pilot! Okay, usually I'm not nuts about copious time travel and callbacks to comics history I know nothing of, but man, is Captain Marvel a wild ride! Not only does Kelly Sue DeConnick have a wicked sense of humor, Captain Marvel has been helmed by a team of artists who want to leave their mark on Marvel with weird viewpoints and dark stylizations. Captain Marvel has blipped on and off my radar the past couple of months, after debuting last July. Frankly, the opening saga went on for two issues too long, with its time-traveling beguilingness quickly shriveling all my goodwill. However, since hitting a couple of stand-alone stories, DeConnick has developed the supporting cast, including a former Ms. Marvel, and let her heroine smash robots and other things with her fists, giving the whole book an afternoon serial, popcorn-y sheen. A sheen with one unique selling point -- the popcorn fun revolves around a woman for once, not a man! It's sad that this should seem novel, but given the fact that Wonder Woman is suffering to carry her own book right now, it's refreshing to see Captain Marvel ditching the "Ms." in her original moniker, and lifting pretty much whatever she wants over her shoulders, and tossing it in jail for all to see. 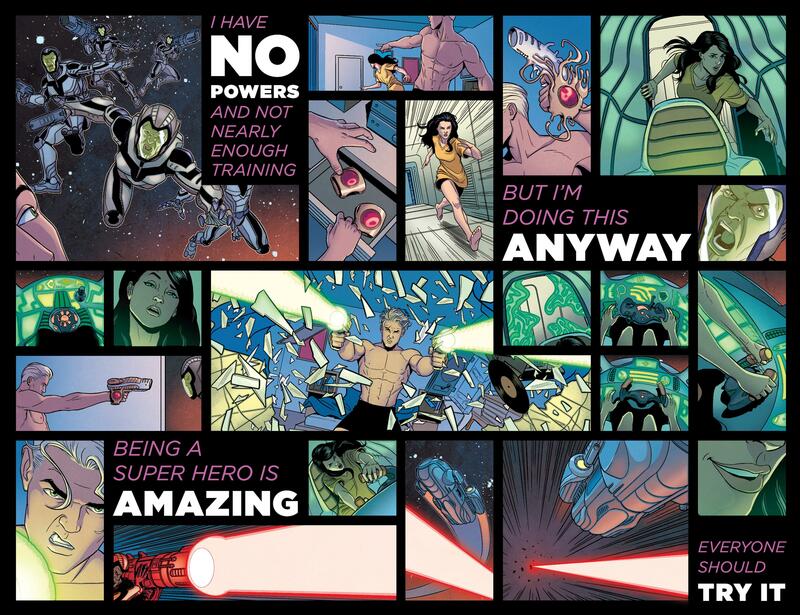 YOUNG AVENGERS, From Top-Notch Creators To The Top Of My Pull List! I've never read Young Avengers before. But that's just fine, because Gillen deftly tells you everything you need to know about the characters in the span of a couple of pages. And the opening three pages provides all you really need to know about why this book will be amazing: there's a Ronettes song, Kate Bishop flying a spaceship, and Marvel Boy (or whatever his name is now) explaining away years of confusing continuity by dancing in his underwear and shooting at alien invaders. Simply put, this book is batty, but the teenagers feel fresh and real, and I look forward to seeing where the super-team of Gillen and McKelvie takes these marvelous, relatable teens. One weird final note -- I also appreciate how Gillen rehabilitates Kate Bishop's reputation by opening the issue with her waking up in a strange man's bedroom. No judgment is made about Kate's appearance or decisions, as would happen in many mainstream books; there's also no cheesecake shots. Her opinion about how she feels is given precedence over what one presumes is a widely male readership's opinion on the subject. It's a refreshing take, and further cements my love for the character, and for Gillen's overall incisive depiction of the female thought process. Kate Bishop is amazing, and I want to be her best friend. Daredevil routinely makes me cry with its dedication to exploring differences in perception. And Captain Marvel and the Young Avengers are well worth the time and expense, since they are tons and tons of fun. Stay tuned over the next couple days for posts on DC's readable books, and independent books everyone should be picking up. It's been fun compiling this list, and I only hope to get people turned on to some good reading!